Please, tell us about how you got into wine, the wine industry and how your career developed? Hermann studied Obstbau at Silberberg in the Steiermark as a teenager. He enjoyed the grape aspects of this course so went onto to study viticulture and oenology at Weinsberg in Germany. On course completion he was bonded to the German government (as an Austrian studying in Germany) so went to South Africa and worked with the KWV for three years. From here he was offered a position starting a new winemaking venture in Nelson New Zealand for the New Zealand Apple & Pear Marketing board. Hermann arrived in NZ on News Years Day 1971. After a couple of years making apple wine Hermann yearned for grapes again. In 1973 we bought our first patch land in Nelson for planting grapes for wine. In 1973 we also bought material for grafting sufficient grape plants for 2 Ha of vineyard. Because there were no vineyards in the South Island trialled 14 different vinifera varieties in that first block. What is your philosophy to making wine and viticulture? Our philosophy is to let the vineyards express the flavour and varietal characteristic of each wine. As we have expanded we have selected sites offering differing soils and micro climates in the Nelson area. Which cultivar is your favourite to work with and why? Riesling continues to be Hermann’s favourite variety. It offers so much opportunity to make a number of wine styles, from dry through to very sweet dessert wines. It performs quite differently on clay to stones to river silt, etc. and give quite different characteristics. So many wines require a lot of ‘winemaker’ input. Riesling is a wine truly representative of its environment. How do you see the future of wine production and what are the challenges and the opportunities? We are continuing to plant vineyards so obviously feel very positive about the future. We have our three adult children working with us and they are enabling the business to continue progressing. 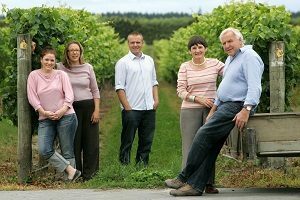 The main challenge at present is the very strong NZ dollar which is having an impact on our return from all wines sent overseas. The NZD has strengthened against all currencies since the Global Financial Crisis. Where do you see the global wine market in 2025? The opportunities we see are the huge number of untapped markets, particularly in Asia and the eastern bloc countries, which we are responding to as the opportunity and wine quantities allows. These countries will see a vast increase in wine consumption in years between now and 2025 as western influences and a more affluence their way of life.